Last weekend, the Cypress String Quartet performed three salon concerts in intimate venues around the Bay Area. This is the second year of their Salon Series, designed to bring intense music into such close quarters with the audience that the experience borders on the visceral. After one night each in Berkeley and San Francisco, on Sunday, January 26, their lush sound overflowed the small hall of the Woman’s Club of Palo Alto, reintroducing a concert that they first put together in 2001. For the last fifteen years they have asked contemporary composers to write a reply to quartets from the established repertoire, what they refer to as their “Call and Response” commissioning program. In 2001 they commissioned Benjamin Lees to write a quartet inspired by Shostakovich’s String Quartet No. 11 and Benjamin Britten’s last work, his String Quartet No. 3. This resulted in Lees’ hugely successful String Quartet No. 5, and they performed all three works together. I was particularly intrigued by this combination, because I had just had the pleasure of hearing the Alexander String Quartet perform Shostakovich’s earlier No. 8 along with that selfsame Britten No. 3, accompanied by explanations from musicologist Robert Greenberg (See Jan. 15 Piedmont Post). Sunday’s concert was a surprisingly different experience, partly because of a deeper understanding, partly because of the intimate hall (some could read the music over the violist’s shoulder! ), and largely because of the personal approach of the Cypress Quartet. While the Alexander Quartet was fiercely tragic, capturing Shostakovich in his political milieu, the Cypress Quartet delineated those bonds of friendship. This quartet was dedicated to the memory of Shostakovich’s childhood friend, Vasily Shirinsky, the second violinist of the Beethoven Quartet, and written one year after his death. “The second violin part was tough enough to honor him, but easy enough for his replacement!” quipped Ward. And indeed, Tom Stone, the Cypress’ second violinist, shone in this quartet. Shostakovich’s intensity kept us on our seats throughout, but there was also a childlike simplicity and humorous whips. Cellist Jennifer Kloetzel propelled them in chords that were violently front-loaded and then released into long harmonies. At other times Ward took a manic perpetuum mobile, high and fast, and then passed it on to Ethan Filner, their formidable violist. They ended, as an elegy should, on a stunning high violin passage that dissipated into silence. I later asked Ward about the violence of those high passages, and she told me that the Amadeus violinist told her to “really attack the strings. His big arm shook!” That unearthly language of birds was also Britten’s apotheosis, and Ward well knew it, as her eyes were closed as she played. Sitting nearly onstage, it was sometimes hard to tell where the music left off and perception or memory began. There were deep fifths and explosive unisons, chords turned into bulwarks of sound with double stops, low viola passages, telegraphic and creepy… and unmistakable moments of 1950s spy movies! And throughout, vibrant colors and rhythms, performed with freshness and immediacy. The busy Cypress Quartet will be appearing in several small venues around the Bay Area in February and March, an opportunity to hear this extraordinary group up close before their tour to the East Coast. After appearances in 15 schools around the Bay Area, they will bring their Call & Response program to SF’s Marines Memorial Theatre on Friday, March 14, starring a premiere by American composer George Tsontakis. See cypressquartet.com for their calendar. Photo of the Cypress String Quartet by Gregory Goode. 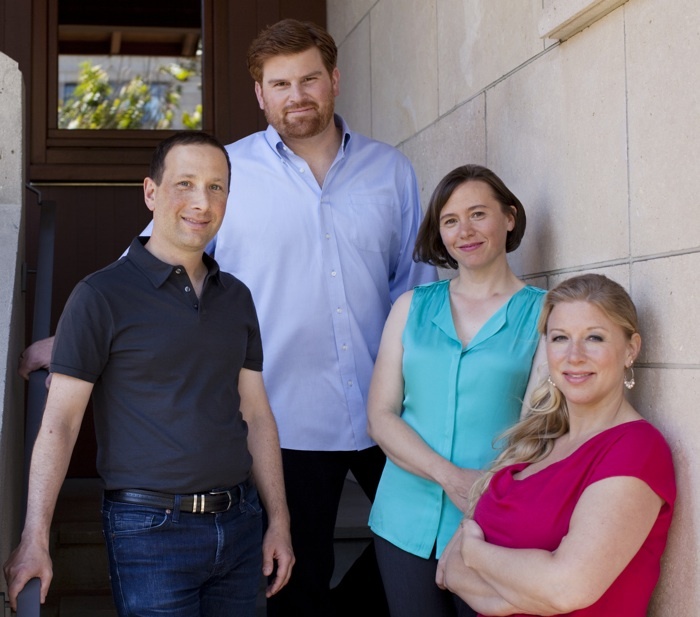 Pictured from left are: Tom Stone (second violin), and Ethan Filner (viola), Cecily Ward (first violin), and Jennifer Kloetzel (cello).